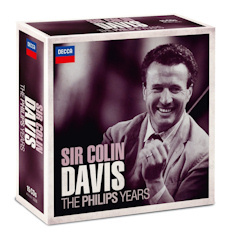 The late Colin Davis was a great conductor for Philips, no questions asked, though his decision to later record and rerecord his core repertoire may not have been the best choice. Still, these generally well-chosen discs encompass a wide range of his first and best achievements. Decca pays tribute to his legacy with a fine mix of classics, hard-to-find albums, and surprises. Each one of these soloists and ensembles was associated with Davis during his lifetime, and so music-lovers should consider this a gift, which in a way it is; it would have been gifted to the conductor as a tribute had he not passed away. This is not an "original jacket" collection, as some of these sets tend to be, and thus allows for some artistic diversity. A full album of Béla Bartók's piano concertos is a justifiably beloved choice; it sounds excellent even if the orchestral contributions are a touch coarse. On disc two, the Beethoven program is somewhat uneven in quality. While Claudio Arrau's "Emperor" concerto is unmatched for weighty, aristocratic poise, the conductor's solo outing in the composer's famous 5th is less impressive from an interpretative perspective. The Dresden Staatskapelle is magnificent throughout, and does give the symphony some special moments. Disc three finds Davis at the Concertgebouw for Berlioz's masterpiece; this is his second recording of the piece for Philips. It's very fine, lacking only the savage wildness of the best versions. But there is also much to admire in the myriad colors the Concertgebouw Orchestra is able to conjure, even if the heat is lacking from the podium. The Mussorgsky is unexpected, and rather low-key. It gathers steam in the middle, and then this glorious orchestra makes as beautiful an ending as I have ever heard. Moving on towards the middle of the set, discs four and five are more Berlioz. The Requiem and Te Deum are massively scored, and when done right, two of the coolest works ever written. These versions are very fine, and are highlights of the conductor's highly acclaimed Berlioz cycle. There's more rawness here than in the Symphonie fantastique with the Concertgebouw; the London Symphony Orchestra and two choruses seem more willing to "dig into" the music. It's still a little tame compared to some other versions (Munch on RCA Living Stereo), but nobody hearing this should find much to complain about. Going from Berlioz to Antonín Dvořák could be jarring, but disc six contains two excellent symphonic performances. This 7th is one of the best ever, dark and passionate and just plain gorgeous. The "New World" is somewhat less special, but only just. I am glad that the 8th was not included, as it was the most tepid of the trio when first released. The Concertgebouw is tremendous throughout the program. The three discs that follow the Dvořák are more variable. The London Elgar is fine, if hardly essential, which can also be said of The Planets. This is Davis' only studio outing with the Berlin Philharmonic, and this is the only orchestra in the set with which Davis was not easily identified. Holst was never his strong point, either; this is very similar to his budget issue on Laserlight in that it's not especially polished or notable. Back at the Concertgebouw on disc eight, this Haydn is classic, and I can't imagine seasoned collectors not already owning the entire set. Disc nine features the Bavarian Radio Symphony in an unusual modern program that shows of the conductor's abilities in modern music. I wish some of his other rarities had been chosen instead. The same feeling applies to disc 10, which features a well-sung but unnecessary Mahler Das Lied von der Erde. Philips and Decca already have several great versions on the market, and this one is not a hidden gem. On the other hand, the Mozart on discs 11 and 12 are mostly excellent. I don't feel like the London Symphony surpasses the Staatskapelle Dresden on Davis' later Decca remakes, but these very early recordings compensate for a lack of polish with great vigor and musicality. Ingrid Haebler is a fine soloist in K. 450; this is a rare recording that is nice to have back in print. While Dame Kiri has never been my favorite soprano, her beautiful voice is heard in excellent form throughout disc 12. My only complaint is that this program – save for the three appended arias – has been released many times before. The London Symphony Chorus also contributes positively, with the Ave Verum Corpus feeling just a little too inert. The sound for the choral selections is also slightly less clear than one hopes for. Rounding out the set are three important albums. The Sibelius program documents his successful tenure in Boston as a guest conductor; his complete symphony cycle still ranks with the best. The tone poems (with the exception of Finlandia) are very difficult to find outside of box sets, or Australian Eloquence. If only that program – never fully released in the USA – could have been chosen! This 1st is a great one, though. Tippett's The Knot Garden takes disc 14, and turns out to be an inspired choice. The music is weird and wonderful, and serves as a memento of the conductor's work at Covet Garden. Davis was a great advocate for Tippett, and he conducted the first performance of the opera a few years before this recording. As far as I know, this is one of its only recordings, and hasn't been seen since the early 1990s. The opera has a very odd plot, most of the people in it are crazy, and the bizarre scoring and bleak sounds may not be to all tastes. But fans of 20th-Century opera will hear things they like. I found the music compelling. Finally, the set ends with Stravinsky's complete Firebird, from the conductor's set of the major ballets at the Concertgebouw. When first released on CD, the ballet was one 40+ minute track. Remedied later, this was an excellent choice. The Concertgebouw has always done Stravinsky well; this is no exception. And Orpheus is no mere filler, as the London Symphony plays wonderfully. There you have it. Fifteen discs of Colin Davis at his early – and mostly – best. Many of these recordings are well-known, but if you have worn out your old Philips Duos or LPs, you could do much worse than investing in this set. Davis never was big on promoting himself, but this box is a worthy tribute to his legacy and gifts.